Your heart has four valves — aortic, mitral, tricuspid and pulmonic — that control blood flow in the heart by opening and closing. Regurgitation — occurs when the valve leaflets do not close tightly, and the valve leaks. Stenosis — occurs when the valve leaflets thicken or fuse together, and the valve cannot open completely. 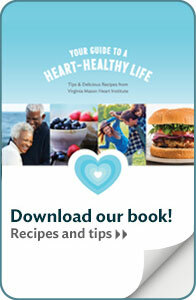 Heart valve conditions can be present for years without causing any symptoms. Often, a heart valve condition causes no symptoms until a person is middle-aged or older. Untreated heart valve disease can lead to heart failure, syncope (passing out) or sudden death. A heart murmur, a whooshing sound your doctor can hear when listening to your heart, may indicate a heart valve condition. The most common way to diagnose a heart valve disorder is an echocardiogram, which is an ultrasound of your heart. When a heart valve condition becomes severe, sometimes the only option for treatment is to repair or replace the valve. A heart valve can sometimes be repaired rather than replaced, especially in cases of a leaky mitral valve. A repaired mitral valve has several advantages over a replacement. The heart surgeons at Virginia Mason are well known for their expertise in mitral valve repair. If a valve cannot be repaired, valve replacement may be an option. The new heart valve can be made of metal (mechanical) or from human or animal donors (bioprosthetic). You will need to discuss with your cardiologist and surgeon which type of valve is right for you. Mechanical valves require blood thinners to prevent clotting. Bioprosthetic valves do not require blood thinners, but may need to be replaced in 15 to 20 years. Blood-thinning medications are called anticoagulants. If you have to take an anticoagulant, the pharmacists and nurses at Virginia Mason’s Anticoagulation clinics will work with you and your doctor to make sure you maintain a safe level of blood thinning. Some people with aortic stenosis may be candidates for transcatheter aortic valve replacement (TAVR), a minimally invasive alternative if open heart surgery is considered to be too risky. TAVR is performed on a beating heart and does not require cardiopulmonary bypass as open heart surgery does. With TAVR, a catheter is inserted into one of the leg arteries, and a new valve is advanced through the catheter to the heart. When the valve is in position, a balloon expands the valve and the new valve starts working immediately. Patients having this procedure usually go home after one or two days. The heart surgeons and interventional cardiologists at Virginia Mason are highly experienced and focused on providing the best possible treatment for you. Every patient with heart valve disease is different. We will help you to understand all the options, and the best options for each individual. Our outcomes and patient safety scores are among the best in Washington state, and place Virginia Mason among the top hospitals in the country. For more information or to schedule an appointment, call (206) 341-1111.